Isn’t it time you valued – not measured — customer satisfaction? Recently I’ve met a couple of companies who couldn’t explain why they implemented a customer satisfaction survey and how they used the results! I hope this is the exception, not the rule. If you’ve carried out a customer satisfaction survey, you probably did it because you want to deliver great customer service and believe the satisfaction survey will give you something to benchmark future results against. If this is the case, you are not alone. Many companies regularly measure customer satisfaction. They send out surveys or call asking questions about satisfaction with service, product usage and more. Most people will have encountered the satisfaction survey at the bank counter that encourages immediate responses, the results of which can impact the manager’s bonus. Others may have received a call from a car workshop after a service or an email from an online service provider. But, unfortunately, the results of such measurement are unactionable. That means customer satisfaction surveys do a poor job of linking cause and effect. 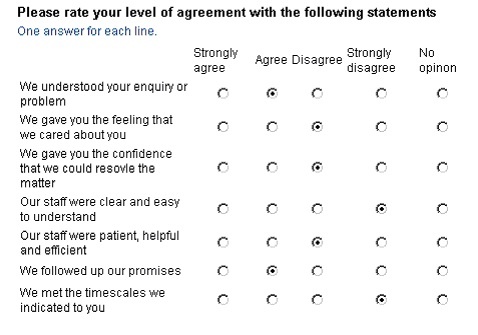 As an example, a traditional survey might ask, “How satisfied were you with the product/service?” And then give 5 options from “Very satisfied” to “Very dissatisfied” but where’s the cause and effect? If customers are dissatisfied with the product, what caused it? Was it a poor sales or other service experience? Or was it because the teller gave the wrong information? An unfair ‘returns policy’? Complexity? A lack of add-ons? Part of a typical satisfaction survey, how measureable are the results? Many customer satisfaction surveys measure the wrong activity at the wrong time, often with the wrong customers. If a walk in customer to a branch of a bank is a frequent visitor who takes up a lot of time making withdrawals or engaging expensive, trained personnel with minor transactions, should the bank care if they are satisfied or not? Another failing of customer satisfaction surveys is that they are divorced from the costs of satisfaction. Yes, customers can be satisfied, but do you really want to satisfy every customer no matter what it costs? Many organizations apparently do and some think good satisfaction scores are considered more important than profits. At least one Malaysian firm boasts of “exceeding expectations.” Not unexpectedly, setting the satisfaction bar so high inevitably leads to excessive expenses, hurting profitability. And it is also misleading. According to Frederick Reichheld, writing in the influential Harvard Business School publication, 90% of industry customers report that they are satisfied or very satisfied. Impressive figures but why is it then that repeat purchases remain in the 30% – 40% range? Surely if so many customers are satisfied, shouldn’t they be making repeat purchases? But most telling of all, in numerous surveys, 60% – 80% of customers have reported they are happy with service, before moving to a competitor! Another issue with satisfaction is that as consumers become more empowered, the less likely they are to be satisfied. According to a survey by Accenture and the Marketing Society, the percentage of people whose ‘expectations of service quality are frequently or always met’ declined from 53% in 2007 to 40% in 2009. If this trend continues, it is unlikely that expectations will ever be met and therefore, what is the relevance of a satisfaction survey? Companies can also influence or manipulate satisfaction scores with the timing of the questions. For instance, if an airline upgrades a traveler from economy to business class on a long haul flight and then calls the next day to ask if the passenger was satisfied will produce a predictable answer. What you really want to do is to value satisfaction, not measure it. Valuing satisfaction means putting an actual cost figure on the satisfaction that is required to keep a customer as a customer. After all, you spend large amounts of money on advertising, sales and other branding tactics to acquire a customer and then when you do acquire him, you ask if he is satisfied with the service. Wouldn’t it make sense to know why he became a customer and what it will take to keep him as a customer? The importance of keeping a customer as a customer is ignored in almost all satisfaction surveys. Yet why would you want to satisfy a customer if 60% – 80% are likely to defect to a competitor with the next purchase? Companies committed to growing profitability instead of expenses are already making the move to valuing satisfaction. One of the first companies was Starbucks. Starbucks prides itself in providing a unique customer experience. In many ways, its brand is based on this customer experience. But Starbucks success meant longer queues that created unhappy customers. So, to ensure continued growth, Starbucks sought to measure satisfaction with the customer experience. Starbucks decided to talk to customers. Its customer research discovered that the average “unsatisfied” customer stuck with the company for a little more than one year, made 47 visits to its stores during that period and spent a total of approximately US$200. Not bad, really, for an “unsatisfied” customer. But look at the value of a “satisfied” customer. The average “highly satisfied” Starbucks customer patronized the chain for more than eight years, made almost double the amount of visits (86) per year and spent over US$3,000 over that average eight-year time frame. What was the primary difference between “unsatisfied” and “highly satisfied” customers? The amount of time the customer had to wait in line. Now that Starbucks knew the value of satisfaction, it could make the appropriate financial decisions. Indeed, once the connection was made between marketing metric and financial outcome, calculating the investment and its potential payoff became easier. Based on Starbucks’ estimate, marketing would have to invest US$40 million annually worldwide to sufficiently reduce wait times and help convert those unsatisfied customers into highly satisfied ones. That’s no small amount, even for Starbucks. If you were the CEO of Starbucks, what would you have done? Actually, the data made the decision quite easy. Since the research had shown that each highly satisfied customer was worth US$3,000 over eight years and each unsatisfied customer was worth US$200 for one year, all Starbucks had to do was calculate the discounted cash flow and determine how many customers must be converted from unsatisfied to satisfied customers to generate the US$40 million in incremental revenue needed to cover the investment. The calculation revealed that Starbucks would rapidly recover its investment in satisfaction. So take a close look at your own customer satisfaction surveys. Are they just telling you how “happy” customers are at a particular time and place and based on a specific transaction? Or do they provide actionable data about customer value? Do they let you know their standards for product and service performance? Do they let you know how customers hold you accountable? Do they provide data that lets you make financial investments in customers that will bring the greatest financial return? What’s needed today – and unfortunately is missing among companies that depend on creativity to build their brand – is a correlation between marketing metrics and financial outcomes. Don’t limit your bottom line with feel-good customer satisfaction surveys that just look at customer good will. Instead, measure the value of their satisfaction. The result will not only tell you the causes of their satisfaction or dissatisfaction, but, much more importantly, provide the hard financial data to determine what to do about it. 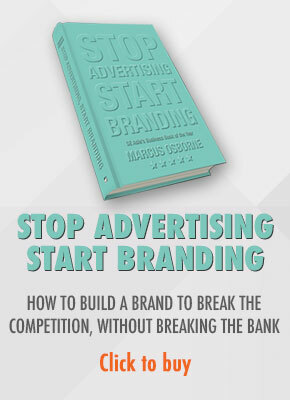 If you like this blog, why don’t you get yourself a copy of my book that’ll tell you why the old branding rules no longer apply and what you need to do to build a future proofed brand? Available now from all good bookshops in Malaysia and Singapore and from Amazon.co.uk. Thinking of hiring a cheap freelancer to design your website? What’s the real cost to your brand? Does it make sense to rebrand Kuala Lumpur’s taxis? Seriously, is #todayishere the new Malaysia Airlines tagline? Thinking of hiring a cheap freelancer to design your website? 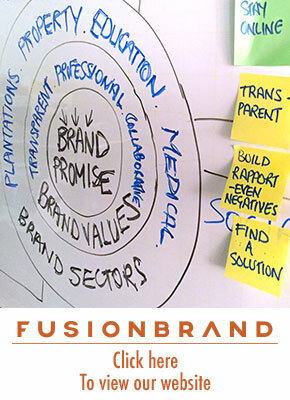 What's the real cost to your brand?